A HACKER believes he saw proof NASA DOES edit out pictures of alien Unidentified Flying Objects (UFOs) from its images before public release. 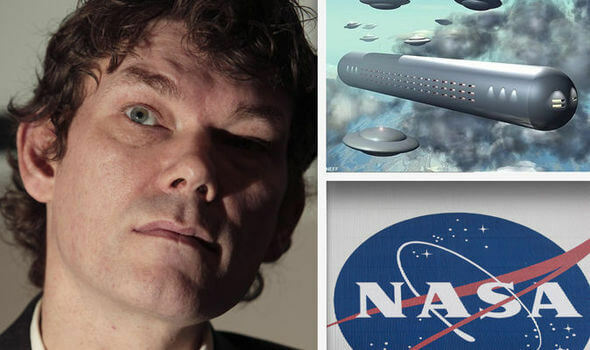 Gary McKinnon, who faced a 10-year fight against extradition to the US after breaking into computer databases of NASA, US military and the Pentagon, has made the shock claims. It remains one of the top alien conspiracist theories – that NASA and the US government has known for years we are being regularly monitored by UFOs from far-flung galaxies. But, in the belief Joe Public could not handle the truth, or it would lead to the breakdown of religion and society as we know it, it has been successfully withheld from us by cover up after cover up. It was when former NASA contractor Donna Hare went whistleblower in November 2000 with claims that NASA staff digitally edited out UFOs from satellite pictures before they were released, from Building eight of the Johnson Space Center in Houston, Texas, that Mr McKinnon, 49, decided he had to know more. An avid interest in the so-called alien disclosure movement, which calls on governments worldwide to release all their top-secret files of UFOs and alien visitations, led him to hack into computer databases of NASA, there US military and the Pentagon, from his girlfriend’s aunt’s home in London. Mr McKinnon said their security was so lapse he was able to regularly gain access to entire databases for between 18 months and two years. But for someone to have gained so much unprecedented access, the disclosures that followed were relatively few and far between. First, while scouring US Navy databases, Mr McKinnon stumbled across a file containing a list of “non-terrestrial officers” with their ranks and names and a separate file of “material transfers between ships”. Although, he has no record of any of the officer or ship names now, he claims further research at the time found no trace of any of the ships anywhere or of the use of the term non-terrestrial officer. Mr McKinnon believes he may have found confidential evidence of a secret space base. Non-terrestrial does not just mean not from earth, it can also mean not land based, meaning the term would not be irregular in terms of the navy. The other evidence uncovered by Mr McKinnon was while trawling the 255 computers of building eight at the Johnson Space Center. He said he started to download an image, but it was extremely slow, and he only got half to 2/3rds of the way down before being rumbled.